My book Cilungu Phonology is now out! It is published by CSLI, and printed by the University of Chicago Press. It's available at Amazon, Barnes&Noble, etc. 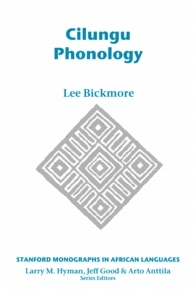 Bickmore, L. (2007) Cilungu Phonology, Stanford, Center for the Study of Language and Communication. Bickmore, L (2007) "Stem Tone Melodies in Cilungu" in Proceedings of the SOAS Conference on Bantu Grammar. SOAS Working Papers, London. Bickmore, L (2007) "High-toned Mora Insertion Between Onsetless Morphemes in Cilungu" in Selected Proceedings of the 37th Annual Conference on African Linguistics, D. Payne (ed.). Cascadilla Press, Somerville, MA. 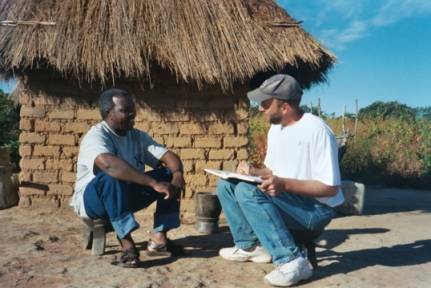 Bickmore, L. (2004) "H-Tone Lowering in Chilungu: Phonological or Phonetic?" in Linguistic Typology and Representation of African Languages, J. Mugane (ed.). Trenton: Africa World Press, 93-101. Bickmore, L. (2003) "The use of feet to account for binary tone spreading," in Frankfurter Afrikanistische Blatter vol. 15, R. J. Anyanwu (ed. ), Rudiger Koeppe Verlag, Koln. Bickmore, L. (2000a) "Downstep and Fusion in Namwanga" Phonology 17.3, 297-333. 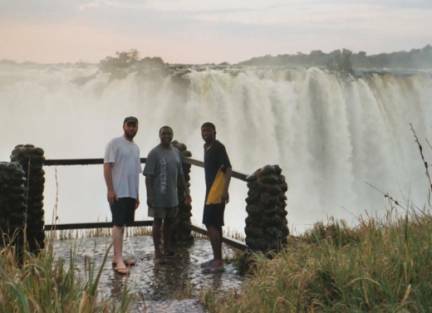 Bickmore, L. (2000b) "Tones and Glides in Namwanga" in Advances in African Linguistics , V. Cardstens & F. Parkinson (eds. ), Africa World Press, Trenton, 135-149. Bickmore, L. (1999) "High Tone Spread in Ekegusii Revisited: An Optimality Theoretic Account" Lingua 109, 109-153. Bickmore, L. (1998) "Metathesis and Dahl's Law in Ekegusii", Studies in the Linguistic Sciences 28:2, 149-168. Bickmore, L. and G.A. Broadwell (1998) "High tone docking in Sierra Juarez Zapotec" IJAL 64:1. Bickmore, L. (1997) "Problems in constraining High tone spread in Ekegusii" Lingua 102:4, 265-290. Bickmore, L and M. Doyle (1995) "Lexical Extraprosodicity in Chilungu" Studies in African Linguistics 24:2, 85-122. Bickmore, L. (1995) "Refining and formalizing the Tahitian stress placement algorithm" Oceanic Linguistics 34:2, 410-442. Bickmore, L. (1995) "Tone and stress in Lamba" Phonology 12:3, 307-342.